Hungarian government condemns the remarks made by a far-right MP to compile a list of residents "of Jewish origin." A Hungarian far-right deputy's suggestion to compile a list of residents "of Jewish origin" sparked an outcry on Tuesday in Hungary, AFP reported. "The Hungarian government condemns in the strongest possible terms remarks made by (far-right party) Jobbik's Marton Gyongyosi in parliament," the government said in a statement quoted by the news agency. "The government is opposed to all forms or expressions of extremism, racist or anti-Semitic, and does everything in its power to combat it," the statement continued. Gyongyosi had suggested drawing up a list of those who might pose a "security risk" for Hungary, citing Israel's recent conflict with Hamas-run Gaza. Gyongyosi qualified his remarks on Tuesday, saying he proposed only a list of residents with dual Hungarian and Israeli citizenship, and asking his "Jewish compatriots" to forgive him. He admitted his comments were "indefensible and open to misunderstanding. I expressed myself badly." Parliamentary speaker Laszlo Kover, reported AFP, nevertheless condemned the "unspeakable" comments. Kover added he would push for a change in the rules to make such remarks in parliament punishable in the future. Opposition Socialist party leader Attila Mesterhazy described the statement as "unforgivable", while the small opposition Democratic Coalition (DK) party headed by former prime minister Ferenc Gyurcsany calling for Jobbik's dissolution. DK also urged a "political quarantine" on Jobbik, encouraging other parliamentary parties not to speak with the far-right deputies, and journalists not to organize interviews. Gyongyosi said he did not intend to resign, when asked by the news portal Index.hu. 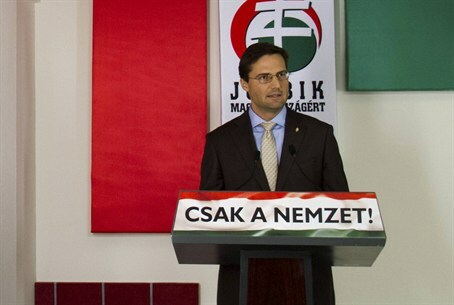 "Hungary need not fear Jobbik but rather Zionist Israel and its servants in Hungary," his party added in a separate statement quoted by AFP. Meanwhile, said the report, the United Hungarian Jewish Religious Community, a prominent Jewish organization, announced it would press charges against Gyongyosi. "Jobbik now openly supports Nazi ideology," said the community's leader Rabbi Schlomo Koves, urging "concrete action from the government and the political parties to reject this Nazism in parliament." The outcry comes after several anti-Semitic incidents in Hungary over the past year, including verbal attacks against Jewish leaders and racist behavior at a football match against an Israeli team. Last week, the president of the World Jewish Congress, Ronald Lauder, called on Hungarian Prime Minister Viktor Orban to distance himself from extremists.